The Toronto Blue Jays headed to Boston Friday night to start a four game series against a division rival, the Red Sox. On Jackie Robinson Day, the blue birds fell short, losing 5-3 handing R.A. Dickey his second loss of the year. Boston took an early three run lead in the bottom of the first inning, which would find them ahead of the rest of the game. Toronto would manage to respond with a run in the second, and get two runs in during the seventh inning, but unable to produce any further. Rick Porcello would be credited with the win, keeping his undefeated streak alive, at two games. He would only let in 3 runs, over 6.1 innings of work, striking out 8. On the Jays side, R.A. Dickey would let in 4 runs through just 4.2 innings, striking out just 3. Craig Kimbrel would come in during the ninth for the save, to give the Sox a 1-0 series lead. 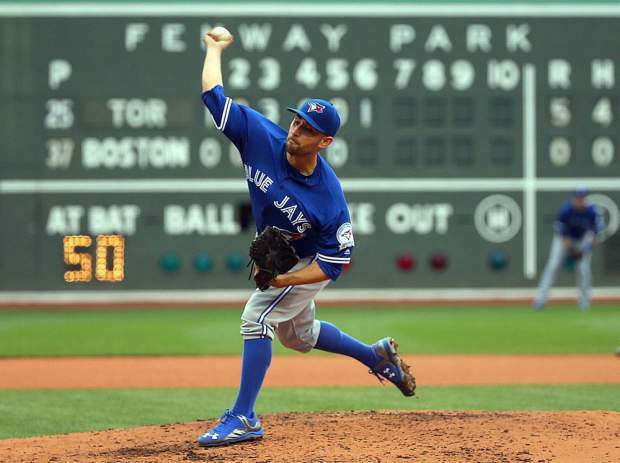 The fans heading to Fenway Saturday definitely got their money worth, as they would see a pitching duel between former Blue Jay David Price and Marco Estrada. 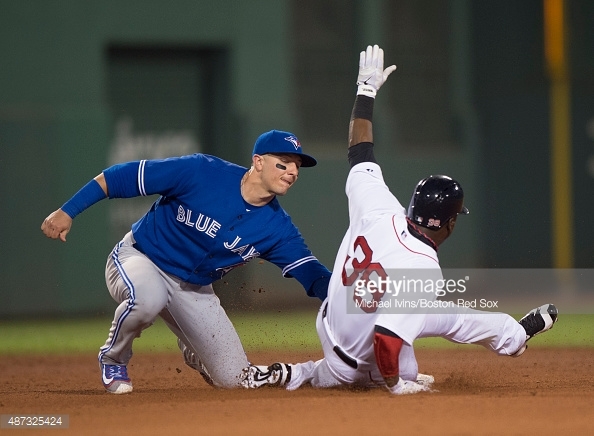 Jays would get a run in early, however Boston would soon respond in the fourth, scoring four of their own. The blue birds would score another in the fourth as Edwin Encarnacion would hit a double, scoring Bautista who singled just prior. That’s all they would manage, as the Jays would fall once again, this time by a score of 4-2. David price would get the win as he went 7 innings, giving up only 2 runs over 6 hits with 9 strikeouts. 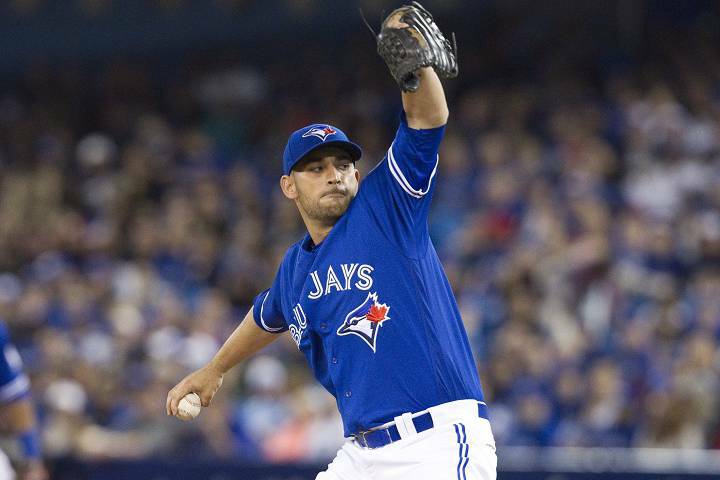 Estrada on the other hand had a decent outing, but giving up 4 runs over 6 innings, striking out only 3, which would be the downfall. Kimbrel would appear once again, earning his fourth save of the year. Game three would be a match-up between the young gun Aaron Sanchez and the knuckleballer, Steven Wright. The Blue Jays would be looking to get a much-needed win, as they would look not to lose the series. 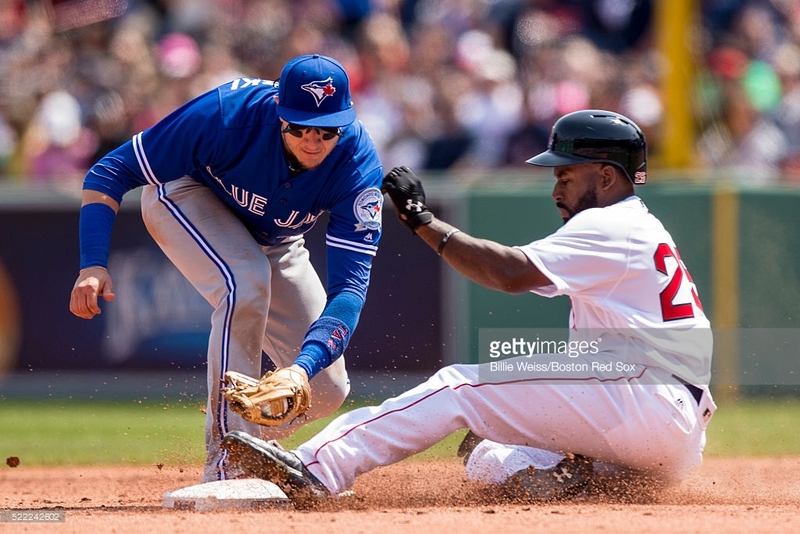 Toronto would pull off a similar situation as Saturday night, getting two runs in during the first inning.This time, it would be the Jays that would have the upper hand, as Boston would fall victim, only getting three runs on, two of which came during the ninth inning. Sanchez was lights out, giving up only 1 run, over 7 innings, striking out 7. Steven Wright would receive the loss as he went 6 innings, giving up 2 runs, striking out 6. During the game, Chris Colabello would find himself shaken up as Wright threw an 87MPH fastball, sending Colabello to the ground for a minute. Wright would perform a class act on Monday, sending a bottle of liquor to Colabello’s locker room as a token of apology, as he truly did not mean to have such a close encounter. Colabello would talk about the incident stating, “He went above and beyond in my eyes. It was pretty obvious there was no intent. You could see by his reaction.” Bravo Steven, well done. 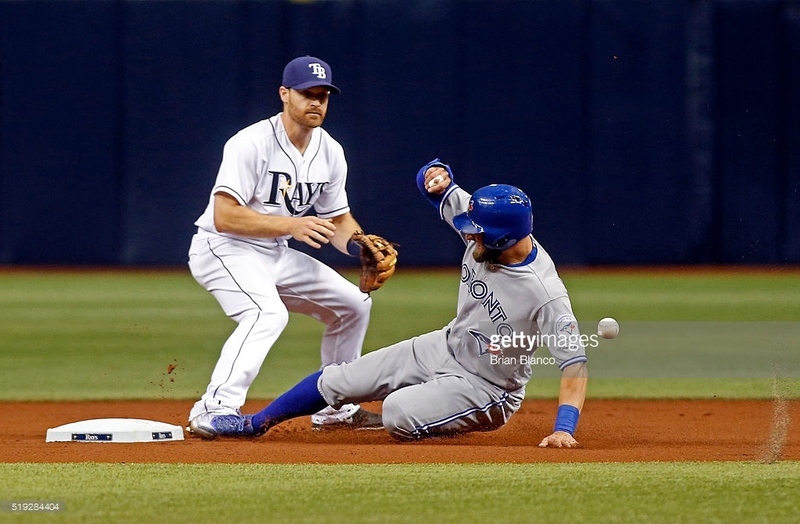 Monday, the Toronto Blue Jays would be looking to even up the series at two games apiece. With an early morning game, taking place at 11AM, the blue birds didn’t have much time to rest, but they would send J.A. Happ to the mound in the series finale as he would be competing against Koji Uehara. The Bo Sox would get a man in early, as Josh Rutledge would double in Hanley Ramirez, making it a 1-0 game. There would be no other action until the Jays opened the floodgates in the top of the eighth, scoring 4 runs. The Toronto boys would appear to have this game won, however Boston would not be done responding with 2 runs in the bottom of the ninth, but would not be able to get anything further, falling 4-3. The Jays would end up splitting the series 2-2. The Blue Jays will now head to face off against another division rival, the Baltimore Orioles who have been on a hot streak. The 7-7 Jays will start a three game series against the 8-3 Orioles, sending their young gun Marcus Stroman who is looking to go 3-0. The O’s will respond by sending Mike Wright to the bump. Wright has only pitched five innings this year, and the Toronto club will be looking to take advantage of that. Game time is 7:05EST. 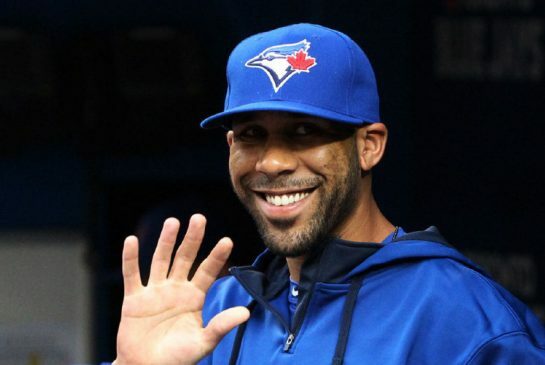 Just shortly after the 2015 baseball season came to an end, the big question for every Jays fan was whether or not David Price would be seen in the Rogers Centre again, in the dugout under section 124. Price’s tenure with the blue birds would soon end however as Price was picked up on the trades deadline as strictly a rental player. This would lead the Blue Jays to their first playoff appearance since ’93, ending their 22-year drought. The Jays did not pursue Price aggressively however. Instead of giving D. Price $217 million, they decided to see him leave and hold onto their funds to eventually be able to share around the clubhouse. Price also stated in the news conference, “This is a place that has winning in their history. They definitely have winning in their future.” When breaking down this deal further, if Price starts 30 times in the 2016 season, he will earn $1 million per game ($9,000 per pitch) as he will wind up receiving $30 million in total. So all in all, even though Jays fans are extremely disappointed in the fact they won’t get to see one of the best in the game every 5 days, time will tell if they will be better without him. That being said, they (Jays) have a lot of work to do to fix up their starting rotation and get some key arms in the bullpen as well. It has been a rough few days for the Toronto Blue Jays. As the club wrapped up their three game series against the AL East basement team, the Boston Red Sox, the Jays were hoping to gain more ground in the east. This would be before heading to New York to face off against the Yankees in a very important September series. The Red Sox would take game one, winning 11-4 in an impressive game for Red Sox fans, not so much for the Jays faithful. The blue birds would then turn their luck around taking game two 5-1 after the floodgates opened in extra innings scoring four in the tenth. Heading into Wednesday night’s game, they haven’t lost a series in almost a month and it would have been their sixth series win. Providing the Yankees would lose to the Orioles, the Jays had a positive look in potentially gaining a two and a half game lead, but things didn’t go as planned. The club would get lit up early as Drew Hutchison who would only go 3.1 innings, would give up six ER off six hits before getting pulled in replacement of Liam Hendriks. 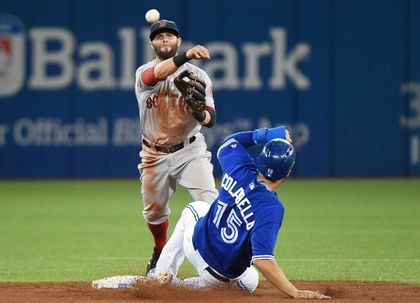 Things would not get better for the Jays as they would only score one run in the fourth, before the Red Sox would score 6 more by the sixth inning making it a 10-1 lead. Delabar would be responsible fore letting in four runs in after coming in for Hendriks. When all was said and done, the Toronto club would go through five bullpen pitchers, in hopes of keeping it close and winning, but that was not the case. The Jays faithful would then turn their scoreboard watching to New York and would be relieved to hear that the Yankees lost their contest. Now, heading into the Bronx, the Jays will hope to improve on their 1.5 game lead. This is the second biggest matchup of the year, which everyone has been waiting for. The biggest one though? That will take place in the last week of September when the Yankees come back to Toronto to face the Blue Jays one last time. David Price will be taking the mound, as the Yanks will send Luis Severino to the mound as his counterpart. Price is also just four innings away from reaching 200 innings pitched this season. He will be looking for win #15, as the Jays will be looking for win #80, and hopefully, going up 2.5 games in the East.